The February writing prompt calendar focuses on favorite books, love, and poetry writing prompts. 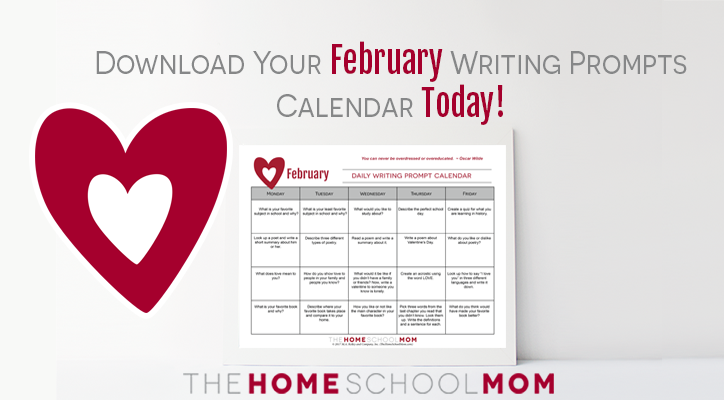 Each month we are offering writing prompts (you will be able to find them all on the main Homeschool Writing Prompts page), and you can download our February-themed prompts below. Our downloads feature white backgrounds and go light on color decorations to help you save ink. This is a subscriber download. SUBSCRIBERS: As a newsletter subscriber, you have access to this and all of the homeschool downloads listed on our download page – just enter your subscribed email address and morningcoffee as the password in the popup box to access the files. Please do not share these files (we are always happy for you to refer friends to our newsletter so they can get access). Subscribers having trouble downloading can click here for help. I love this idea. My daughter always needs new ideas for her journal so I think she will love your writing prompt suggestions. I will go download now. Thanks!